Edited by blob2 at 00:11, 26 Nov 2018. Yeah, imho we are yet to see an obviously bad card. Class Legendaries seem at worst decent, Loa ditto, almost every epic looks usable and they are really pushing for variety this time around. While BDP was only mechs + a few cards for existing archetypes, this time a lot of archetypes of old might make a comeback. Even if some cancer decks will appear (and it seems really likely ), I for one will have a lot of stuff to experiment on. I love how Team 5 NEEDS to stay true to their trollden values. Even in an expansion that seems to be going in the right way. So much "fun" and wackiness as a f2p player if you get this from a pack... damn how it would be nice if they gave it a rest already. I'll probably craft it. It's a card that can go into any possible Druid deck, and the art is also cool. 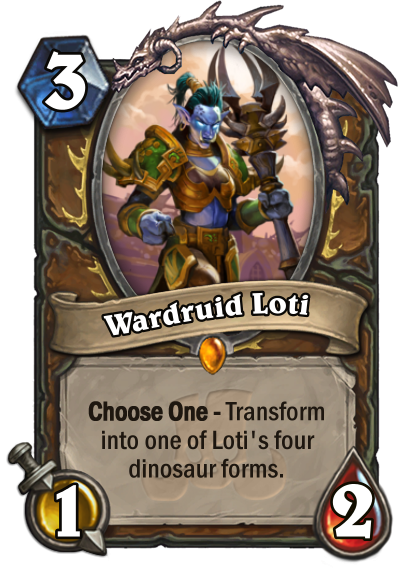 Wardruid Loti is the most underwhelming card so far. It is a legendary that can transform into 4 different common cards.. But yes the artwork is great and Fandral form is great! Edited by blob2 at 11:08, 25 Nov 2018. Yeah, but instead of those 4 common cards which would clogg your deck you get an all-in-one package. One of those is a non-rng "Huffer", and Huffer to this day is a menace. I also wouldn't underestimate that +1 spell dmg, there aren't many spell dmg minions that fit into Druid, and now you get an option to simply pick it when needed. Or removals without backslashes (the poison Beast). 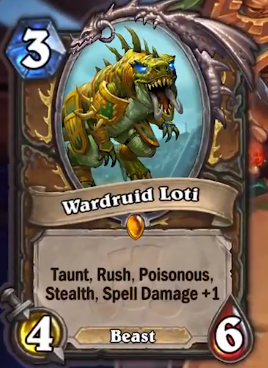 Also remember that we have quite a few Beast synergies for Druid and at 3 mana it's easy to play it. Ofc it's not a super powerful card, but I like such balanced cards which you can throw in any Druid deck. When I craft a Legendary I want to see it in as many decks as possible. At least that is how I see it. I get that the flexibility and beast tag is what makes Wardruid Loti good. But I had just hoped for something different. The Dragon Warrior! So War Master Voone and his dragons really pleases me, but wait what is that - Akali the rhino that fits the rush theme? Why do I become annoyed when not all the cards follow the theme of the class? I do think Akali has a place in warrior since Witchwood exists. The new rogue legendary. Balanced, but! Too costly for pirate decks. Edited by blob2 at 16:15, 26 Nov 2018. Well, I know what you mean with Loti as Legendary, not too flashy she is, but we can all agree this class needs a bit of cooling off, it's pretty damn strong currently. 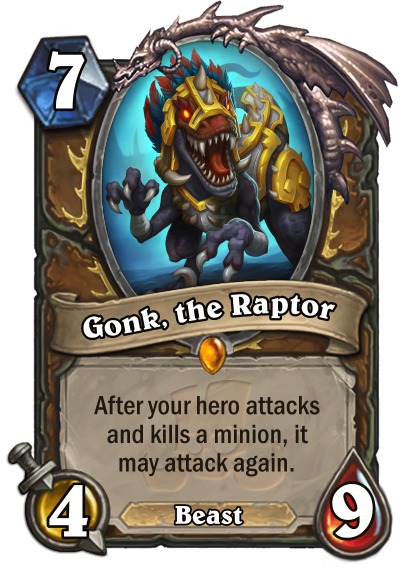 We'll see what Gonk will bring into the fray, but I suppose something with the Hero Power (to synergize with totems). Otherwise the Totems seem pretty useless. I wonder if he will somehow boost it permanently... which would be strange as we already have a few cards that change the HP like Baku or the DK. Regarding Akali: do you mean Rush and Dragons at the same time? Well, we can all see that this expansion is about variety: they are really trying too push various decks, which I personally like very much. Taking Warrior for instance: Dragons are getting a boost, so is Rush and even "damage yourself" minions - in Overlords Whip. This will be a good occasion to bring back some decks of old. I've been thinking about Akali and he might turn just fine, we'll see what the totems do. Maybe Rush and Dragons will work in the same deck? Druid is getting balanced Getting some new twists to their class, but not nearly as powerful as previous. Thank you. Da Undertaka is fantastic. It is just perfect from now on and forever..
Today is Zuljin day <3 I am so psyched. Edited by blob2 at 10:19, 28 Nov 2018. So, what do you think emil? Battlecry very powerful, Hero Power not so (although it targets anything). They are pushing for spell Hunter, and Hunter has a lot of really good recyclable spells now: Secrets, stones, Call of the Wild or the new one that respawns beasts. Will see play in slower Hunter decks I think. 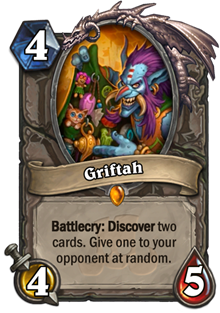 I wonder how it will cope with the loa, it will probably be revealed later this day. Btw cool reveal video. EDIT: Oh, so they revealed Krag'wa ahead of the stream. It's decent. So that only leaves the Lynx loa which will probably be OP (as Hunter is in this set). PS: There's a voting that gets you a free RR pack on playhearthstone. So what do I think about Zul'jin!?! First of all he is strong. He is Yogg for crying out loud, but a better Yogg because you can play a specific set of spells that can win you the game. I love it. BUT I hate that he is not lore based or hunter themed (I know they are pushing spell hunter). I am a little tired of them ignoring obvious lore and themes. Edited by blob2 at 21:15, 28 Nov 2018. Going back to the stream itself, what surprised me the most was probably how well "Feral" Druid with Gonk worked. Putting Gonk behind a Taunt and using Pounce (which really elevates the deck imo) produced quite a lot of value. I will definatey give this deck a try if I will have the right cards. Discard Warlock might be very strong: the 6 mana minion that draws 3 discarded cards is terrifying in this deck. Healadin will be enjoyable, but I think the deck they presented had too many needles cards. Priest was weak, but they showed some interesting cards in stream deck. I think Auchenai Phantasm will be quite useful. And Hunter was... even more OP then I thought. I mean the totem seems so good albeit slow, but the snowball potential is great. Halazzi seems like a solid card to use in any Hunter deck: many synergies and a late game card filler/control card. The Hatchet will be everywhere, such a nice weapon without drawbacks. Lastly Dragon Hunter, as pointed by players, didn't get enough tools to make it viable. I mean, it will be playable, but rather as a hybrid deck or in Wild. It lacks cheap Dragons for Standard imo. Rush with Warrior Totem looks good, but I think there are still not enough good Rush minions. Edited by Minion at 20:57, 30 Nov 2018. I'm gonna try the expansion out for sure, I have some 20000 dust I think so I will craft a lot of goodies. I think my plan is to get Halazzi first. Reading through comments I discovered that the card is really cool for Quest Hunter, a deck I really liked to play back in the day. Hunter has many interesting cards in RR so there will be space for experimentation. Hope I'll get it as a freebie or in packs, if not probably this will be my first craft. I want to try Healadin, but I'm afraid the deck will be tricky to play, will need to see. Edited by emilsn91 at 19:26, 04 Dec 2018. I like Kibler way better than Day9. Though I like Frodan the most. As for the blizz employee to be at the stream, anybody else than Weylan and that dude who revealed Witchwood.. This is expansion is the best since Catacombs. Else I am looking forward to Shaman and hunter decks. Gonk, Hakkar, Warlock Legendary Troll..
Edited by blob2 at 10:14, 05 Dec 2018. 40 packs and only Hooktusk (plus Jan'alai as a freebie). Wonder if I'll ever have a decent first packs opening... this actually killed the hype for me. EDIT: I had a hunch Gonk might be "more then meets the eye". Not many people (me included) knew his effect actually stacks, so when copied with Floop/Faceless for instance when you kill a minion the number of additional attacks multiplies by the number of Gonks. You can reduce his cost with Florist, and use Twig to run a combo for like 36 dmg with Pounces and Bites. If you're missing opponent minions on board, you can use Leeroy to spam Whelps. In consequence a new OTK archetype was created. I might actually craft him, I enjoy Malygos Druid and this looks similar. Emilsn, oh dude I would have wanted Hakkar! Legendaries were Hex Lord Malacras, Gral The Shark and Grag'wa The Frog. Not really what I was looking for but I can do something with them for sure. Edited by blob2 at 12:13, 05 Dec 2018. Hakkar is interesting, but not something I'll craft probably. Zul'jin - clear winner of the set so far, everyone is praising him. Thing is, I miss quite a lot of tools for Spell Hunter, as I've never been interested in this deck. Jeklik - seems to be a staple in Discolock which I want to retry (though people say they can't make it work). But I didn't get any of the essential new Discard cards (like the 6/6 one), so again, a big dust investment would be needed. Guess that makes Gonk the first choice, but I'll probably need to wait and see a bit how the meta shapes. Hakkar in a Mill deck? Suicide? I am thinking of using him here for the first month. Mainly for the lols. I am just so annoyed that they dont do these MAJOR characters justice. They did with the lich king. I crafted Thekal. I had a wild-control-healadin deck that I turned into standard and added a little bit of the new. Including Thekal. I am thinking about crafting Shivalla as well, but not sure she fits well enough atm. Oh and Krag'wa is next on my legendary list. Edited by blob2 at 13:00, 12 Dec 2018. Jan'alai is a safe craft imo. Really easy to trigger his battlecry. I run him with an Elemental package. Btw I think Arcanosaurus is also really good. Halazzi is also a good craft. Really useful in any Hunter deck imo. I think we will see a lot of him. Btw I also went a bit ahead and crafted Oondasta (with Halazzi, for my Quest Hunter deck). I think it's decent, not groundbraking but a nice late game tool in Beast decks. So far I'm quite enjoying these two decks, should give me enough entertainment for a while. Edited by blob2 at 20:26, 13 Dec 2018. Got Shirvallah (the Tiger) from a pack. I thought she was only good in Healadin so was hesitating to craft her, but she's actually decent in many decks. Currently I'm using her in a Kaleidosaur/Lynessa buff deck which is really fun. It's quite easy to reduce Shirv cost with "Sound the Bells!". It appears she's well received by the community. Almost 50% decks run her atm based on Hearthpwn statistics. Quite a few interesting decks to choose: variants of Healadin, OTK Holy Wrath or Prelate buff. I browsed a few decks, but so far I settled on a tweaked variant of the buff one like I mentioned above. I miss too many cards for Healadin and don't want to craft them specifically for it. I have yet to feel joy with playing Rumble Run. It feels stale.. Not fresh at all. Just like the Witchwood one felt like a rip off of the Kobolds, this too feels like a copy paste job..
Edited by blob2 at 09:38, 19 Dec 2018. EDIT: Incoming nerfs. 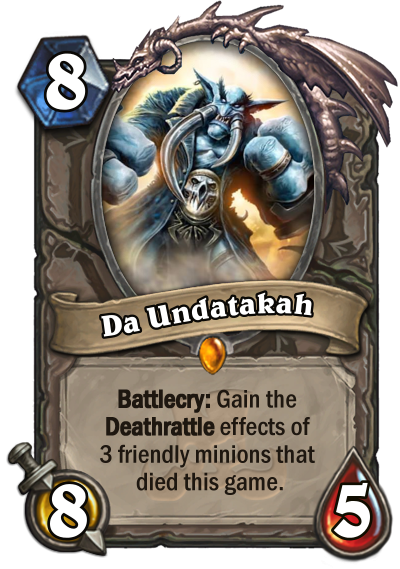 Ofc players are extatic as this crushes/hits all the currently hated decks: Druid, Kingsbane Rouge, Odd Paladin and Shudderwock Shaman. On the other they almost always hit Classic cards which kinda devaluates their role as being cards you can use universally... cus they "limit the deckbuilding space". People point that the problem is the powerlevel of the newer cards like Ultimate Infestation, but Blizzard knows better cus $.